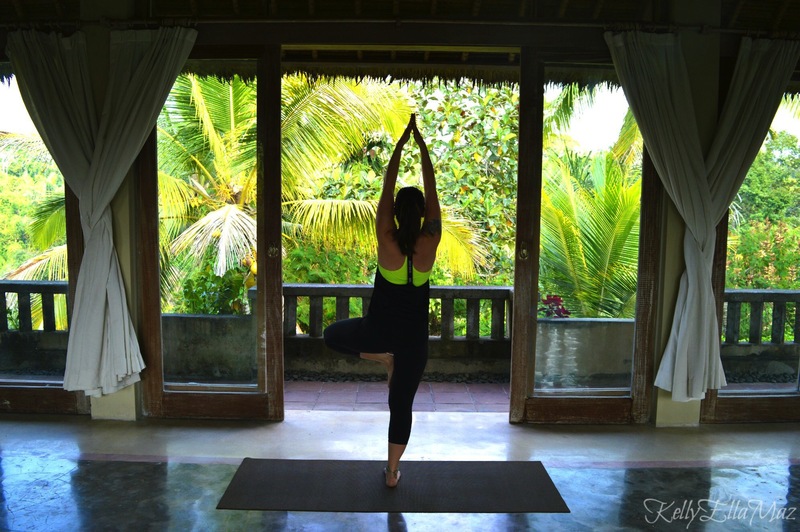 All things yoga related, yoga anatomy, playlists, yoga core, yoga apparel, yoga books, yoga teachers and studios, spirituality, yogic thought, yoga poses, yoga photos, yoga and cleansing, the chakras, mulha bhanda, uddiyana bhanda, deep breathing, yoga benefits, yoga sequences, yoga and sports, yoga for men, yoga for stress relief, yoga at work, yoga for injuries, types of yoga, best yoga music, handstands, press handstands, advanced yoga, Los Angeles, Fitness, Health, core strength, pelvic floor, stretching, power yoga, vinyasa yoga, ashtanga yoga, hot yoga and much much more! Current Yoga Teaching Schedule (Also available for privates, Text (310) 985-0218. 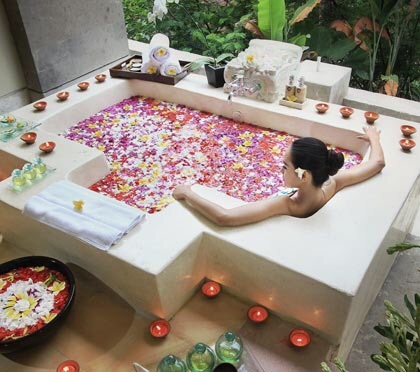 Escape from the routine of daily life and rejuvenate among the rice terraces, temples and palm fronds of beautiful Bali! Do you feel too busy to take time for yourself? Does it seem like no matter how fast you go, you aren’t getting anywhere? Then this retreat is for you! We often become separated from the joy of our true nature as we become immersed in the grind of work, stresses and worries. When we relax we reconnect to our true nature that is joy, love and happiness. It is our intention on this retreat to decompress, unwind and rejoin with the powerful nature that is at the core of our being. What does it feel like to aligne with the powerful being that you are? Find out in Bali! Soothe tired muscles after of day of play soaking in bathtubs as big as a hottub. 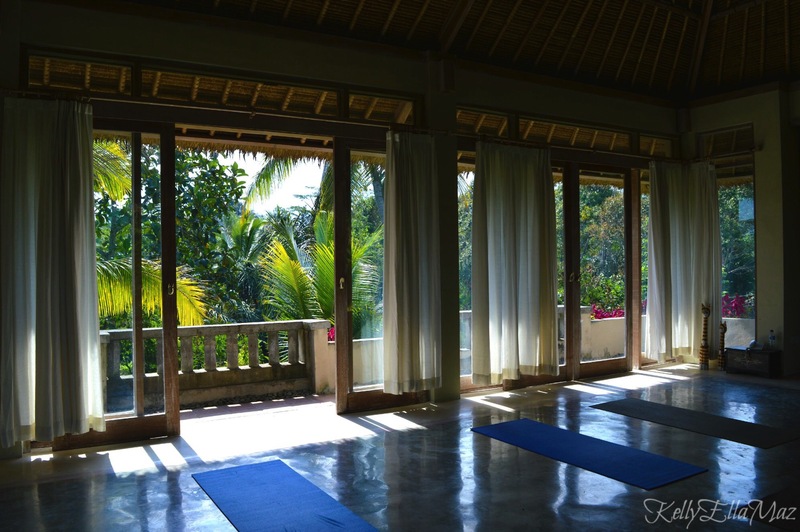 Your days will begin saluting the sun in the gorgeous yoga Shala with glass doors overlooking the breathtaking rice terraces below. We will then eat a healthy breakfast and ….. Most lunches will be on your own as you follow your own path of delight and discovery. 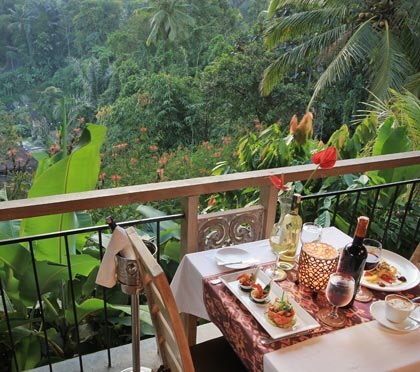 In the evenings we will rejoin each other for a strong or restorative practice followed by another nutritious and fortifying meal in the open air restraunt that overlooks the jungle paradise. Later soak in your giant tub before the evenings festivities! Pricing: Please note that all prices reflect early bird pricing and go up an additional $250 after May 1st. For more information e-mail ajoyfulyoga29@gmail.com or text or leave a message at (310) 985-0218. Angela’s world class Inversion Instruction will help your practice grow wings you never imagined. After a life changing injury, Angelas Soul purpose unfolded down the path of yoga and today she teaches others to move beyond their fears and limitations. While her stunning mastery of advances poses provides inspiration, she maintains a magical knack for leading yogis straight into the achievement of postures they never thought possible, distracting them with humor, inspiring with music and leading with colorful metaphor. Delicious Healing Food – Breakfast, lunch, and dinner served buffet style. All is local, fresh, and wonderfully healing and healthy! Excellent coffee, teas, and fresh juices served with each meal. 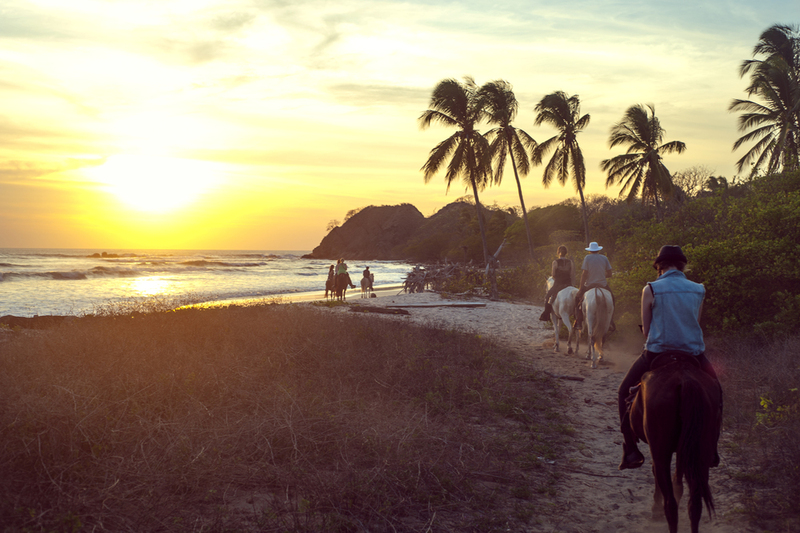 Daily free time to explore Costa Rica as you wish! Public computer for your use, Wifi, telephones and International calling cards(for purchase). Sustainability- Blue Spirit is to committed preserving the natural beauty of the area by sustainable green practices. That commitment includes; Solar powered water, reclaimed water for the gardens, eco-friendly air conditioning, natural ventilation, recycling & composting, and earth friendly operational practices. To reserve your spot it is a non-refundable cash deposit of $500. Please be advised that credit or Paypal payments will have a 3% surcharge. Please call me, Angela Kukhahn at (310) 985-0218 or e-mail me at ajoyfulyoga@yahoo.com for all inquiries and reservations. All reservations made before Nov 1st will receive the early price which is $100 less than reservations placed afterwards, so sign up early! 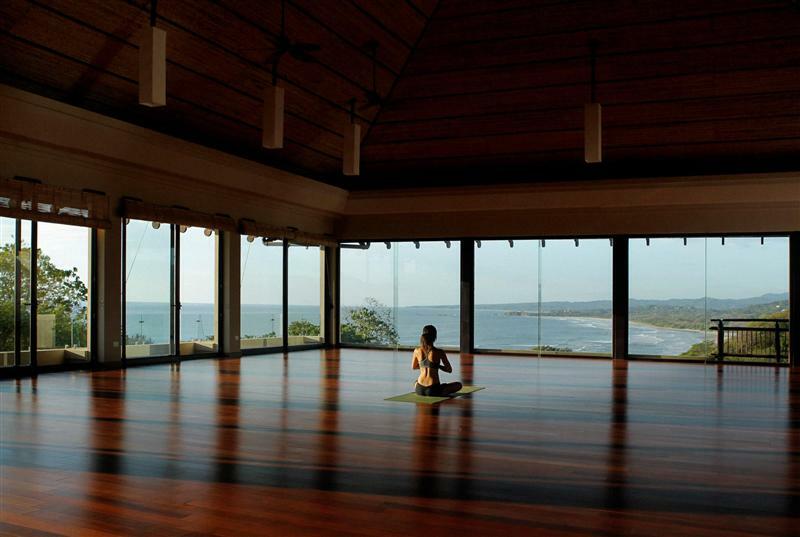 If you’d like assistance in booking flights, travel insurance, or vacation packages to explore more of Costa Rica before or after the retreat, feel free to contact travel advisor and fellow yogi Louise Sper (louise@steadywanderlust.com or 310-901-1921). Louise has traveled to Costa Rica numerous times and can provide advice or suggestions on visiting this beautiful country. Visit the Blue Spirit Website to see even more photos. Superior Room with A/C, superior ocean views, private bath, and king size bed. These beautiful double rooms have beautiful step-out balconies and extraordinary ocean views. 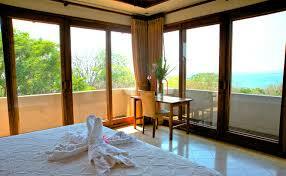 These rooms are elegantly furnished to provide our most luxurious space for couples or singles. 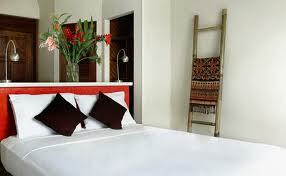 Each room has a king-size bed, a private bathroom with solar hot water and air-conditioning. Nature Suite with A/C, private bath & king or 2 twin beds. 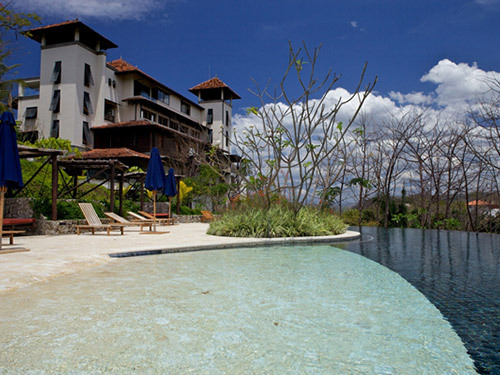 These suites are situated on a hillside overlooking the lush vegetation. 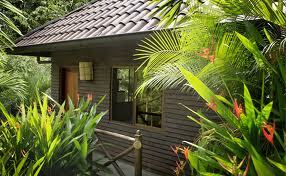 These simple and natural wood frame structures have private bathrooms with an outdoor shower overlooking the jungle. Each suite sleeps two people and includes a separate enclosed porch with a desk for reading. Each room has solar hot water as well as A/C. These rooms are a short walk up the hill to the main building. Hermitage Single/Couple Room with private bath, these rooms are specifically designed for traveling singles to provide privacy and elegance, while being cozy and inexpensive. Many of these rooms have partial views of the ocean and others of the mountains nearby, a queen-size bed, a private bathroom with solar hot water, ceiling fan, and screened windows to enjoy natural ventilation. Eco-Cottage with shared bath-house and 2 twin beds, these cottages are beautifully situated in lush vegetation, allowing for a sensual being-in-touch experience with nature. They are simple and natural wood frame structures with screening for natural ventilation. Each cottage sleeps two people and share a common bathhouse that has solar hot water showers and everything runs on solar powered electricity to provide a comfortable and ecological setting. The Eco-Cottages are situated below the Main Building and involve a short hike up a stone stairway to get to the main building. Platform Tent with shared bath-house, Queen size air mattress, linens provided. For the true jungle experience. These platform tents are situated in lush vegetation, allowing for a sensual being-in-touch experience with nature. Getting to the Blue Spirit Click HERE! For the month of September I will be doing a semi-private backbend series. The mini-workshops will take place at Yogaworks, El Segundo, CA every Sunday in September from 10-11am. If you have ever wanted to deepen your backbends, but didn’t know where to start, this series is for you! * Meditating in the underground Kiva & more! 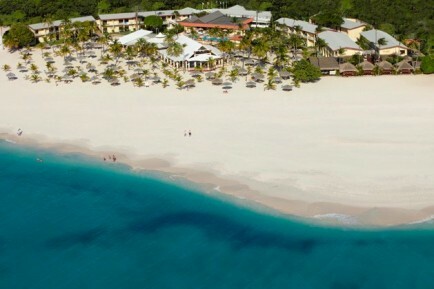 Price per person is $795.00 which includes lodging for 4 days and 3 nights, all meals, classes & events. Lodging is first come first served. We encourage camping, the grounds are beautiful! We are extending a special price of $695, please let us soon if you prefer to camp as these spaces are limited. *For couples or anyone seeking more privacy, private cabins are available for an additional fee of $125-350 per person. Massages may be scheduled, please reserve yours early, there are limited time slots. A non-refundable $200 deposit holds your space. You can pay by cash or check or to make your secure deposit via PayPal. All major credit cards accepted. Please note that a 3% surcharge will be added if you pay via PayPal bringing the total deposit to $206. Click HERE. This weekend has something for all levels of flyers so come willing to sweat, play, and let go of some old fears! Beginner: This inversions basics workshop is designed to make you comfortable to go upside down. We will discuss the fundamentals of inversions; begin with an inversion specific warm-up followed by core work, headstand A & B, forearm balance, and handstand at the wall. Intermediate: This workshop is playful on purpose to get you out of your head and flying with ease. While staying grounded in the essential elements of alignment, we will play with creative ways of balancing away from the wall. 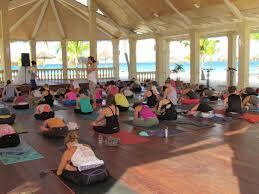 Expect a strong Vinyasa warm-up, plenty of core-work, and lots of fun. Intermediate & Advanced: For the advanced yogis, this workshop will focus on slowing things down and moving exclusively from the core to control your inversions. We will discover the importance of the abdominals as we play with scorpion in forearm balance and handstand.